Westminster’s motorcycle parking charge: socially exclusive? Westminster City Council have been charging for motorcycle parking in the heart of the British capital since August 2008 and still remain the only council that charges for motorcycle parking in London. When the scheme was being set up, it was Westminster’s intention to spread it all over London and the rest of the United Kingdom by selling their services to other councils in exchange for a fee. Westminster’s plans failed through for various reasons, which fall outside the topic of this post. A campaign called “No To The Bike Parking Tax” started shortly after Westminster’s introduction of the motorcycle charging scheme and, despite thousands of motorcyclists demonstrating in the streets of London every month and blocking the traffic, the council refused to scrap their blatant money grabbing scheme. The campaign took Westminster Council to the UK courts twice to challenge the fairness of the scheme and the way it was set up, but did not succeed in obtaining an adverse judgement against the scheme. 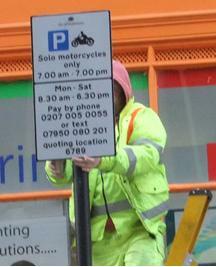 This campaign has since gone quiet and the motorcycle parking tax in Westminster continues to operate. We now wonder why other London councils have not followed Westminster’s lead to charge motorcyclists to pay for parking. The reason is very simple: Westminster’s motorcycle parking scheme is regarded by many as being socially exclusive, thus other councils are reluctant to adopt a similar scheme and prefer to keep motorcycle parking free of charge. Let us explain. To park your motorcycle or scooter on-street in the central London borough of Westminster, you must own a credit/debit card and a mobile phone. Once you have parked your bike in a dedicated motorcycle bay, you need to dial the number that is indicated on the adjacent sign, and using your touch telephone keypad, pay the tax with your credit/debit card. So what if you do not own either a credit/debit card or a mobile phone (or both)? Well, basically, you are stuck, as paper based tickets issued by the very few on-street machines are not practical for motorcycles. If you find yourself in that situation, you are strongly advised to ride back to where you come from to avoid receiving a penalty charge notice (PCN). You can also consider yourself a potential victim of social exclusion. If you do not own a mobile phone but have internet access and a credit/debit card, you can pay the charge online in advance to riding into Westminster. However, if you do not have internet access (or a mobile phone for that matter), you are unable to prepay for your parking and, thus not allowed to park your motorcycle in any council’s dedicated bay. You can, again, consider yourself a potential victim of social exclusion (needless to say that by paying in advance, you are not guaranteed a parking space as prepaying for your parking does not mean that you are booking a parking space). If you’re based in France and want to take part in the fight against the Government’s continued policy to ban motorcyclists from filtering through traffic, then contact the Fédération Française des Motards en Colère (FFMC – French Federation of Angry Bikers). Si vous habitez en France et souhaitez participer aux manifestations pour la circulation inter files des motocyclistes dans les embouteillages, contactez la Fédération Française des Motards en Colère (FFMC). This article demonstrates the need for an organisation with clout, like the FFMC, that is prepared to confront the likes of Westminster Council. Last month’s publication on the unfairness to bikers in Watford also illustrates why we need help in our daily struggle to achieve basic equalities, which I’m afraid UK motorcycle representative groups seem to believe is unworthy of their consideration. This post is spot on. I am not a motorcyclist but work for another London council and they have been considering charging for motorcycle parking. I don’t work in their parking department but have seen internal emails and memos suggesting that because there is no practical ways of charging for motorbike parking other than electronically, social exclusion is an issue that has made them decide to keep motorbike parking free. So keep on fighting against Westminster. It is true that their scheme has an element of social exclusion.